Cardiff City manager Neil Warnock. Pic; Getty Images. More than 3,000 travelling fans sang, cheered, roared and danced after their beloved Bluebirds snatched a thrilling 2-1 Premier League victory against Southampton at St Mary’s. Sol Bamba and substitute Kenneth Zohore scored the goals to ensure Cardiff City earned back-to-back wins in the top flight for the first time in well over half a century. Captain Bamba and his team followed their home win against Bournemouth with a win on the South coast, inflicting a first defeat of 2019 on their hosts. Saints had been unbeaten in five Premier League games, but City powered to victory and jumped above their rivals. The win lifted Cardiff out of the bottom three into 15th place – sixth from bottom. Tributes to Emiliano Sala. Pic: Getty Images. 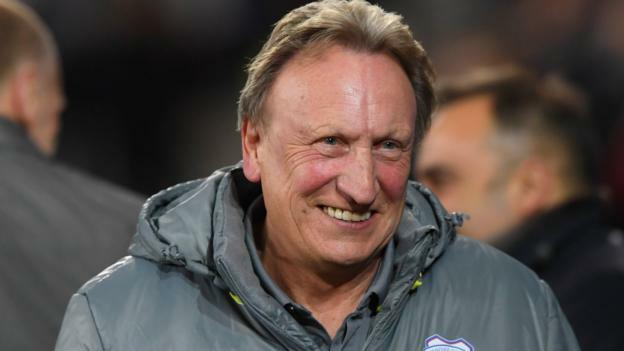 “We wanted to do it for Emiliano and I’m really proud the lads have done him justice,” said Warnock. “We should have beaten Arsenal and won three on the trot. We’ve been superb in the three games since the tragedy. “It’s appropriate that we came down here with the black armbands on and with a performance like that. “We’re still going to be odds on favourites to go down, but we shouldn’t have gone up. “And we should only have 11 points according to some pundits, who are meant to know the game inside out. So we continue to surprise people. “The only people we don’t surprise are me and the fans. Bluebirds captain Sol Bamba said: “It’s been a tough couple of weeks. While City management, players and fans celebrated a crucial victory, Southampton were angrily assessing how they had suffered defeat. Saints manager Ralph Hasenhuttl was furious with his players and described the result as a ‘disaster’. Austrian Hasenhuttl said: “It’s a disaster. We have to sleep the night over because at the moment it feels horrible. But maybe it will feel worse, not better, when we wake up in the morning. “I’m so disappointed. I have problems to find the right words. It was a difficult game, as we expected it would be. “Cardiff shot three times on our goal and we conceded two goals. If we [keep doing this] we have no chance to stay in the Premier League, that is for sure. “Giving points away in that way, it would be very, very difficult. You can talk about tactics and everything else, but the way we gave four points away this week has rolled a big stone in our way and it will take a lot of work to move it. “The atmosphere changed in three minutes. Three minutes before we were happy that we could stay two points ahead of Cardiff. And then we gave it away. We had a big chance. First against Burnley. And now again. Cardiff showed great team spirit and character. They battled for each other during the first half when Southampton threatened to take control and went ahead when Bamba netted after 69 minutes. Joe Ralls took a corner, Callum Paterson flicked on and Bamba supplied the finish. The Bluebirds were devastated when Jack Stephens equalised a minute into injury time, arriving at the far post to tap in Charlie Austin’s flick-on. But they refused to be denied and Zohore fired his first goal of the season when he prodded home from close range in the fourth minute of injury time. It was another emotional time for the Bluebirds. The cry went up ‘Sing a song for Sala’ and that reverberated around the away end at St Mary’s. A minute’s silence was observed for Sala and pilot David Ibbotson. Oumar Niasse in action against Southampton. Pic: Cardiff City. For the third successive match Cardiff players and staff wore yellow daffodils in honour of the Argentine striker, while they also warmed up in T-shirts which had a picture of Sala on the front. Southampton had 67 per cent possession, but Sala’s Bluebirds went home with all three points. Southampton: McCarthy, Bednarek, Stephens, Vestergaard (Elyounoussi 72), Valery (Gallagher 83), Højbjerg, Romeu, Ward-Prowse, Bertrand, Long (Austin 72), Redmond. Subs not used: Yoshida, Austin, Gunn, Targett, Slattery. Cardiff City: Neil Etheridge, Lee Peltier, Bruno Ecuele Manga, Sol Bamba (capt), Joe Bennett, Aron Gunnarsson (Leandro Bacuna 62), Callum Paterson, Harry Arter, Joe Ralls, Bobby Decordova-Reid (Kenneth Zohore 62), Oumar Niasse (Victor Camarasa 83). Subs not used: Josh Murphy, Alex Smithies (gk), Nathaniel Mendez-Laing, Junior Hoilett.